MRI (left) and ITS (right) images assembled as a stereo pair (view cross-eyed). The top and bottom pairs are the same, but the bottom set has the measured jet centers marked with lines to aid the eye in interpreting the three dimensional structure. Jets 2, 3, and 4 project toward the observer, while 6 and 7 tilt away. 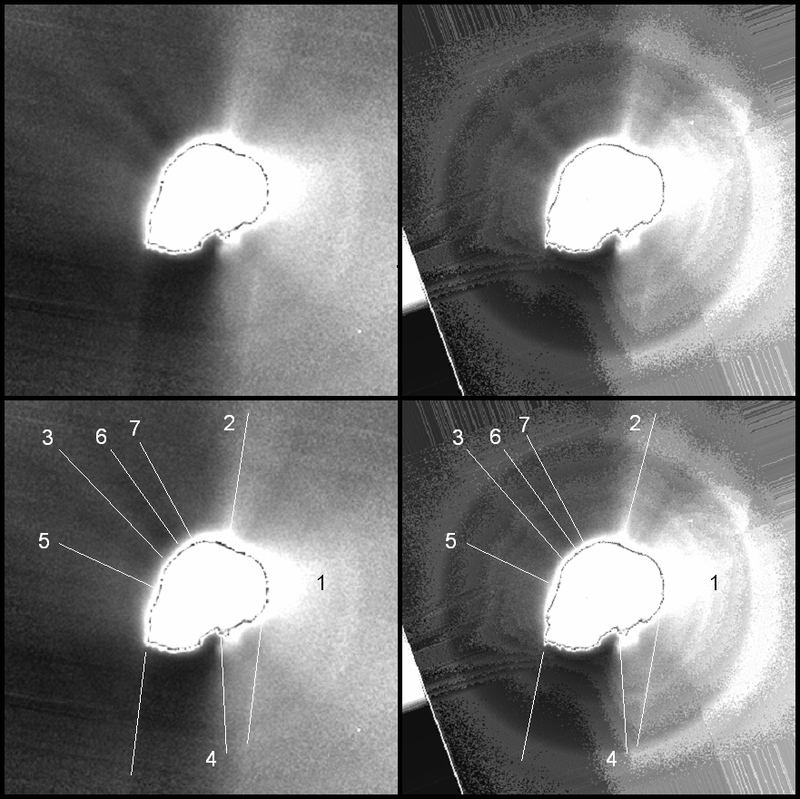 Jet 5 shows little projection in or out, which may be due to the fact that it is nearly parallel to the spacecraft's motion and therefore the parallax acts along the axis of the jet. The two unlabeled lines at the bottom are the edges of the nucleus' shadow. The circular annuli in the ITS images are caused by internal reflections in the instrument optics. The orientation has been rotated 80° counterclockwise from our usual presentation, to put the spacecraft's motion along the horizontal direction (and make it easier to see the stereo effect).